I don’t know what it is but as the number 70 is approaching I am feeling it as a landmark! If that is the proper word for age markers. The past decade is included in this multi part series of I feel “living” and I humbly realize that I have had a full invitation with maybe too many chapters while amongst you all. The chapters of this hypothetical play were very long. Lack of knowledge, young and foolish for sure at times, temperamental [as I still am! ], pockets filled with currency at times and at other times only staring at stale bread sitting near a couple jars of peanut butter and jelly which honestly I am not tired of. Regardless of the hardships or the comforts depending which years my memory chooses to remember the chapters, the monolog and dialogs used sometimes, more now than ever, have shorten as the responses of the questions have been abbreviated throughout these years. Sometimes as it has happened, one word can replace a whole page while ending up with the same meaning at times actually fanning that meaning and letting the mind wonder… “what does it really mean?”. I have to say it! “Have people become nuts?”. What is going on and where is all of this going? Do I care or am I just watching the unraveling of this Society which I feel too often has gone mad. I just was not raised as such and my own values have never been what I today read. I have always believed of course everyone should have an opinion. Nice if they coincide but also if they don’t what happened to respect towards each other? Seemingly words have become weapons I would say of mass destruction while most are hiding behind the screen used to deploy them. What happened to mature discussion and is “mature” still has the same meaning as it used to? Too many questions… right? Too many dilemnas, too much of everything laid out with no sense or reason so publicly with so much afront. I keep calling these last years of mine my last “hoopla”. I can’t remember where I found that word but it seems to fit. So many surgeries, probably a couple more awaiting not too far away and while I think of my seven bypasses I wonder how long they will hold up! I knew Life would never be the same without Lance. I knew it would never be the same without my Mother, my pillar! And I now know Life again will change direction without Spirit. As I drop my arms raised towards the skies imploring to only make this an unreal dream I realize it is not and so naively I ask myself “so what am I going to do now?”. I have not yet fallen off the cliff and all I can think is of an answer unlike me: “I don’t know…”. I have learned to take Life one day at the time. One moment at the time. I don’t know about tomorrow and truthfully how would I know? No “savant” here for sure. Just bite into the present’s substance and live with the gifts lately unwrapped. Maybe all gifts are not suppose to be pleasant ones. It is only how we interpret that word. Some gifts are not even wrapped as their substance directly hit our conscience and make us fight for survival as another question arises “how will we survive?”. There is a new star up in the skies these past couple nights and it’s name is Spirit. I know that dogs only go to Heaven, especially him. The nights gained one star and the days lost one only replaced by the many memories him and I have created sometimes seemingly not even believable. Words have totally escaped me these past few days replaced by an emptiness almost touchable. It is as the present is frozen and lying to me at the same time. I am still in my thoughts left behind to the day when I finally picked him up from the shelter. I am still there! I keep asking myself how can this happen? Has it really happened? Is Spirit really not with me anymore? Dam it is hard. Spirit is gone but I can still sign his name as he will always be here in “spirit”. 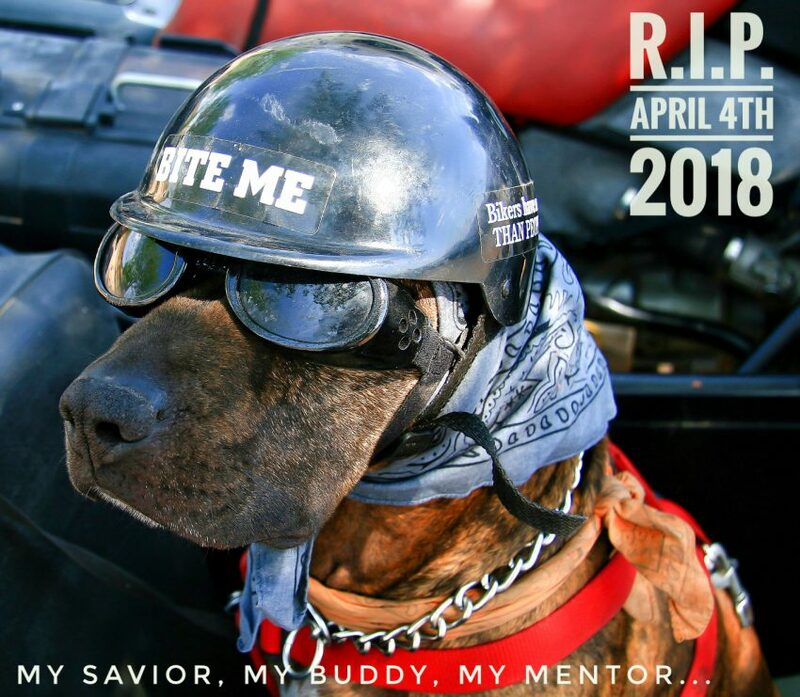 This entry was posted on Wednesday, April 11th, 2018 at 8:40 am	and is filed under travel, spirituality, pit bull, sidecar, motorcycle, cooking, photography, riding, homeless. You can follow any responses to this entry through the RSS 2.0 feed. You can leave a response, or trackback from your own site. Deepest sympathies for your true loss. Sadly. they never live as long as we do. I am so sorry to hear of your loss. Spirit was very lucky indeed, to have you as his master and friend — as were you to have him. Spirit’s memory will burn bright for you, as well as for those of us who were following your adventures. I may not have ever had the pleasure of meeting Spirit in person, but he has been part of my life for the past few years as well, and he has made it a better place. Rest in Peace my dear friend Spirit. God bless you, my friend. Losing your long-time companion and partner in your recent life’s experiences is a terribly difficult thing. You rescued him from a very uncertain future at the shelter… You gave him all the loving care possible, including him in your every activity. You made him an integral part of your family. And he loved you for it, as you loved him. All part of God’s grand design, I think. I know if I could change one thing in my “Universe”, it would be to grant our pets longer lives that more closely match our typical lifespan. I don’t mean to sound sacrilegious, but over the years, I have lost 2 boon companions much too early, and I know that the time is growing short for my most recent Best Buddy, Chinook. I toast the relationship you had with Spirit, and I mourn his passing. Oh, Ara, I am so sorry to hear about Spirit’s passing. My sincere condolences. We’ve never met, but I’ve been following along for the last few years. I am truly sorry to hear about Spirit. This comes just a day after I was also in the unfortunate place of saying goodbye to my faithful dog of over ten years. It was one of the worst days of my life making the decision to end hers. Time catches up with all of us. Thank you for taking us along. Thanks for sharing Spirit with us in some small way. Arms around you, Ara. Have followed you and Spirit for many years; riding along side mentally. My husband and I are dog lovers too and have had to let go of several to take that walk across the Rainbow Bridge that leads to dog heaven. Spirit will always be with you! What great companions you were to each other! Take care Ara and know that there are many, many of us holding you up in our thoughts for your continued presence. My deepest condolences on the loss of your beloved, loving companion. He was truly a very special dog. May he rest in peace. I’m so sorry, Ara. i would like to say simply, I don’t have words for your loss. I will not relate stories of my own animal/companion loss, as that would be selfish of me. I will not tell you to get another friend, since if, when, or ever, that is your decision and this is your time to grieve. You do not need my advice, as you are plenty wise. What I can do is thank Spirit when I look at the stars tonight, and you as well, Ara. Through your words, photos, videos, and recipes, you and Spirit have touched so many by sharing your adventures and experiences with us all. i thank you both, two remarkable beings, for all you have given, yet asked for nothing in return. Rest In Peace, Dear Spirit….Rest In Peace. Ara, I am so sorry for your loss. Spirit was and will always be a good boy. My heart goes out to you Ira, on the loss of Spirit. I too suffered the pain of having to put down “my little buddy” Kybee after 14 wonderful years this past September. The writing from Beth Norman Harris is just beautiful. The tears flowed as I read it and thought of my Kybee. Time will heal, but never completely. They will always be in our hearts and minds. May you have all you need as you cope with this parting. The years you two shared were a gift to him beyond what most creatures have enjoyed. You did well , be good to yourself now, too. You chose a great name for a dog I have come to love through your words. He’s part of me, and I suspect many of your readers. I can’t speak Lizzie or Jack’s name without a tear rolling down my cheek. They were the loves of my life as Spirit was yours. They all, now, Rest In Peace having had the best lives we could give them. Better that they left before we did as no one could love them more, and the thought of them being alone is worse than suffering the grief we suffer now. We are better people because of them—we know the purest kind of love that many never know in their lives. My thoughts are with you, Ara, during this very difficult time. I’m so very sorry for your loss. I really enjoyed the videos of Spirit in his side car. He always looked like he was having such a great time. I think he knew he was a lucky dog to have you Ara. I am so sorry, Ara. You did the most loving thing for him. May you find some comfort in that fact. Spirit lives on in the hearts of those of us who fell in love with him through your photgraphs. His energy and interest spoke. So sorry. No matter how much time we have with them it’s never enough. I will think of Spirit when I have the privilege of going home and walking Rusty. So sorry. I’m so very sorry for your loss Ara. Spirit has occupied a space in your life, and in the imagination of others, myself included, that is a testament to the experiences the two of you have shared over the years. It is difficult to imagine him moving on. When I read the news the first thing I did was call my dog Junior. He’s just approaching 10 but I know what’s down the road for these beings who live such fiery bright lives. While it’s an honor to share the world with them the partings are tough. My thoughts are with you as you navigate the days and weeks ahead. If your experience is like mine of canine friends from the past, the hurt and sadness are eventually replaced by fine memories. My dear, wonderful Ara; I want to know what in the world can be said to comfort you because all I want to do right now is wrap my arms around you and sob, but I know that wouldn’t be very comforting. Sweet, sweet Spirit — so much a part of you and loved every bit as much as you are loved. So I will give Einstein a great big hug and be glad that he won’t feel the sadness about his good buddy Spirit going before him. I know the best time Einstein had was when he got to hang out with Spirit when y’all visited. Spirit had a wonderfully positive impact on animals as well as people. Man, if that isn’t special and unique, I don’t know what is. Spirit was loved . . . and can continue to be loved even now. We’re all with you, Ara; if there is anything Dean or I can do, please let us know — we are just a phone call away. He will remain in your heart forever, as well as the love you and Spirit had for each other. Time will help change the pain into wonderful, happy memories until you and your beloved Spirit are together once again. Until that time, his star shines brightly throughout the entire universe. The next time I look up at the night sky, I’ll say helllo to Spirit. So sorry to hear about Spirit. He was special to many of us who follow your travels. My sincere condolences to you. Although Spirit was the reason Zak and I struck up a conversation with you that Spring day at Panther Junction he most certainly was not the reason we came back to visit you at the Oasis. You are the reason. Your insights, your photographic eye, your sidecar adventures, your honesty, your wisdom, your words, your search for peace – all have inspired me and my sons. We share your sorrow and, having just seen this, your tears as well. Ride on Ara. Thank You Steve, Zak and Alex. You three always hold a special space in my heart, in my memories. Hope our paths cross again soon.Ara and Zoey. Don’t know how to say but its so sad, I can understand how special he was to you. Please be brave as life has to move on.